EAN Does not apply UPC Does not apply Brand Unbranded MPN Does Not Apply Type Gamepad Model H2 Color Black. The shoulder buttons, face buttons and the D-pad all feature pressure sensitivity making them as precise as possible depending how much force is applied. Design and Shape - The Stratus features a contemporary style to fit right in with the rest of your Apple devices. MOGA Rebel Premium iOS Gaming Controller - iPhone/iPad/iPod Mac HGHA2ZM. Condition is brand new never used with an opened and distressed box. Fully tested and working. Warning : NOT all IOS game suppport controller .Free app for list of controller supported games (MFi-4-Gamerz), over 1000 games listed, roughly 50% Free, 50% Premium As any MFi controller, only game that supports controller is playable by controller, check above before you order. IPhone X is tested and it works, but please note iPhone X has a weaker bluetooth than previous iPhone Shipped with USPS Priority Mail. BRAND NEW IN SEALED BOX PXN Speedy Wireless Game Controller Pad for iPhone/iPad/iPod/ Apple TV. See Pictures for Details. Shipped via USPS Priority MaiL With Tracking Provided Promptly. Model: HGHA2ZM. Designed with most exacting standards and built with the finest components, gaming with the REBEL must be experience to be believed. The REBEL connects wirelessly via BluetoothTM so you can set up your iPad, iPad Air or iPad Mini on a stand and play from the comfort of a chair. Condition is New. (no cables or charging block). Our Tablet gaming grip features the creative integration of a phone grip and a stick-on joystick. Winner Winner Chicken Dinner! ONLY for Apple devices listed below, with iOS 7 or later. iOS 7 or Later. Dedicated On/Off Slider Switch to enhance battery life even further, also includes Dedicated Pairing Button. iPad mini, iPad Air, iPad 4th Gen.
You will receive exactly the item you see in the picture. PXN Speedy Wireless Game Controller Pad for iPhone/iPad/iPod/ Apple TV. Condition is Used. Shipped with USPS Priority Mail. Features: Easy to operate Sensitive and dependable assistant game equipment Gamepad for PUBG Adjustable handle position Comfortable hand feeling to bring you more pleasure while playing games Can protect your phone from falling effectively Specifications: Type: gamepad Suitable for: ipad iphone android Dimensions: 140mm*110mm*50mm Material: plastic metal Packing Includes: 1 x Game pads(Pair) Brand Unbranded Type Gamepad MPN Does Not Apply Color Black UPC Does not apply. Designed by SteelSeries in Denmark. Bluetooth v4.1. Requires iPhone, iPad, or iPod touch with iOS 7.0 or later. Apple TV (4th generation) with tvOS 9.0 or later. Suitable for: ipad iphone android. 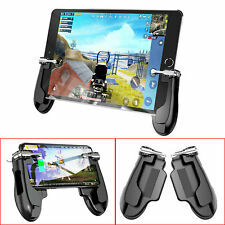 Mobile Game Controller for iPad, weini Tablet Game Trigger Fire Button Aim Key Gamepad L1R1 Controller for PUBG/Fortnite/Knives Out, Support 4.5-12.9 inch Tablet Smartphone(1 Pair) Make sure this fits by entering your model number.Tablet Game Trigger --- weini Mobile Game Controller the use of Tablet screen area is less, does not affect the line of sight, the key is designed in the back of the Tablet, close to the finger, long press not tired, make the mobile phone more comfortable. After installation, it can be directly used without locking the screen.Supported Games --- The Tablet Game Triggers Support iPad and almost games on Android , Perfectly compatible for shooting games including PUBG, Fortnite,Rules of Survival, Knives Out, Survivor Roya. SteelSeries Nimbus Wireless Gaming Controller for Apple TV, iPhone, iPad, iPod. This item is in great used conditions and is fully functional. The one pictured is the one you will receive. Description： 100% brand new and Sensitive reaction gaming trigger Comfortable handle is not tired after playing for a long time According to personal preference installation position to achieve the most comfortable feeling Radian design and anti-skid texture Compact and convenient,easy to operation Gamepad interface type PS/2 Vibration mode:no vibration Packing Include: 1 pair gaming trigger Brand Unbranded Type Gaming Trigger MPN Does Not Apply Connectivity Wireless UPC 663250736039.